One of the largest planes in the world flying from Dubai was met by police, ambulances and firetrucks at John F. Kennedy International Airport on Wednesday when nearly two dozen passengers and crew members reported feeling ill during the 14-hour flight, officials said. Emirates Flight 203, an Airbus 380, landed at approximately 9:12 a.m. from Dubai and 19 passengers and crew members reported symptoms that included coughing, a headache, sore throat, fever and other flu-like symptoms, New York City health officials said. The Centers for Disease Control and Prevention originally reported that as many as 100 people on the flight said they felt ill.
Nearly three hours later Emirates Airline confirmed that 10 of the 549 crew members and passengers — which included rapper Vanilla Ice who recorded the 1990 hit single “Ice Ice Baby” — and crew members were transferred to Jamaica Hospital Medical Center, while nine refused treatment. 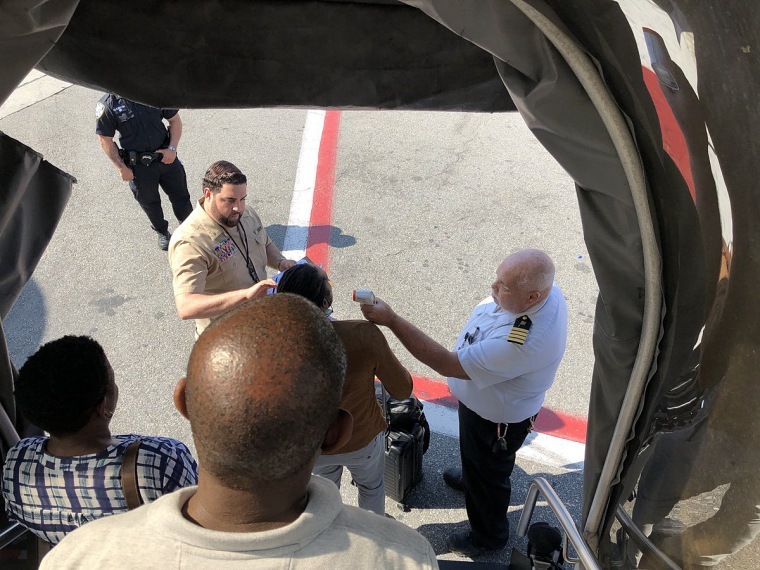 “All passengers were screened by the local health authorities prior to disembarkation, and three passengers and seven crew members were transferred to the hospital for further medical care and evaluation,” an Emirates Airline spokesperson said in a statement. “Nine passengers underwent additional medical screening at the site near the aircraft and were released afterwards. The rest of the passengers were allowed to leave and clear customs. Dr. Oxiris Barbot, the acting commissioner of the New York City Department of Health and Mental Hygiene, said at a news conference that the agency had obtained respiratory samples from the 10 patients. Those samples were being tested at the city’s public health lab, and they expected results late Wednesday night. The illness apparently also came with stomach issues, forcing crew members to triage the restrooms. “The bathrooms were in high-demand to the point where they actually shut down a couple of bathrooms,” said Sykes, a passenger. Demetre Daskalakis, the deputy commissioner for disease control at New York City’s Department of Health, recommended that travelers wash their hands and get vaccinated for the flu before departing on a trip. The CDC, meanwhile, said that passengers who had been evaluated and released should call their health care provider and local health department if they develop any symptoms. A representative for Vanilla Ice, whose real name is Robert Van Winkle, confirmed that the rapper was on the flight after the star of the home improvement show “The Vanilla Ice Project” tweeted about being on the plane. Van Winkle’s representative said the rapper was released with the other passengers because he did not exhibit any symptoms. He had already departed JFK Airport by 4 p.m.
Officials with the Port Authority of New York and New Jersey said in a statement that the A380, the largest passenger aircraft in the world, was taken to a location away from the terminal so emergency officials could evaluate the situation. White House Press Secretary Sarah Sanders said the president had been briefed and will continue to monitor the situation. Diala Makki was traveling first-class on Flight 203 en route to New York Fashion Week when she learned from flight crew that a number of people had become sick on board and passengers were to be detained until officials made checks. Makki, a television host from Dubai, said she got “just a little bit scared” through the entire experience and was aware of reports of 100 people sick. “That’s what I heard, but the cabin crew told me it was 10, so I don’t know,” she added. An Emirates Airline spokesperson said that the A380’s return flight to Dubai would be delayed by at least three hours.